Information on the announcement of a new incentive to attract top graduates into teaching maths. Top graduates will be enticed into a rewarding career as a mathematics teacher with a prestigious £20,000 training scholarship led by highly regarded mathematical institutions. Education Secretary Michael Gove today (Friday) announced a new partnership with the Institute of Mathematics and its Applications (IMA) in collaboration with the London Mathematical Society (LMS) and the Royal Statistical Society (RSS). These bodies will work together to offer around 150 scholarships, worth £20,000 each, to graduates with a 2:1 or a first-class degree wanting to train as a mathematics teacher. This comes as part of the government’s efforts to raise standards in the education system. It will also help Britain compete and thrive in the global race and spread privilege across our country. High-quality mathematics education is at the heart of improving our society and our economy. By working together, these prestigious institutions will help deliver a scholarship scheme to make sure we have excellent mathematics teachers in this country with deep subject knowledge. It will help raise the status of the teaching profession and also make a huge difference in the lives of children. The IMA, in collaboration with the LMS and RSS, will work with other experts in mathematics, statistics and teaching practice to award scholarships to candidates with a strong mathematical background, an excellent understanding of mathematics and statistics at school level, and a commitment to education and teaching. As well as the tax-free £20,000 bursary, the scholars will receive additional benefits and opportunities from the IMA, LMS, and RSS. This includes membership offers, support in their teacher training and early career, and free access to journals, conferences and events. The scholarship comes as part of the coalition government’s teacher training strategy. It follows from the success of the scholarships led by the Institute of Physics, and will sit alongside additional scholarships for chemistry and computer science announced earlier this year. Mathematics, through its applications, already contributes massively to the UK economy. Research also shows that those who do well at mathematics at school are likely to earn significantly more than their peers. The scholarship scheme designed by the IMA, on behalf of its collaborating bodies, will attract highly-qualified graduates and career-changers who might not otherwise have considered teaching as a career. These scholars will help strengthen the mathematics teaching force in its capacity to inspire those who will determine the future. This scholarship scheme will increase the number of good mathematicians who become good mathematics teachers, and will ensure they feel welcomed as members of the broader mathematics community. Bringing into schools more teachers with a deeper understanding of the subject will give many more children an intellectually stimulating encounter with mathematics, and an understanding of it which they in turn will use and share. Getting the best people into teaching mathematics and statistics in schools is a crucial step in helping children to develop the analytical and numerical skills they need for further academic study and exciting careers in a whole range of areas. Inspirational teachers can provide motivation, insight and enthusiasm. Statistical literacy is an essential life skill: the need to make decisions based on numerical data confronts us all in every aspect of our professional and personal lives. Latest figures show that the government’s reforms to improve teacher training have already had an impact on the quality of graduates opting for a career as a mathematics teacher. More than six out of ten (62 per cent) of those entering teacher training in the subject this year now have a 2:1 or higher degree classification - up from 51 per cent in 2010/11. We want the brightest and the best graduates with a strong mathematics background to join the profession. These scholarships will help us to do this. The scholarships come as part of the Coalition Government’s drive to improve the standards in mathematics. Latest international data shows that performance in mathematics has plateaued with other jurisdictions’ performance improving faster than in England. Overhauling the primary and secondary mathematics curriculum to be much more rigorous and in line with the best countries internationally. The new programmes of study will be out for formal consultation early next year, for first teaching from September 2014. Funding good quality mathematics professional development for primary, secondary and post-16 teachers, through the National Centre for the Excellence in the Teaching of Mathematics (NCETM). Giving primary schools the opportunity to employ teachers who have been trained as specialist mathematics teachers. We have launched a primary mathematics specialist programme, on which the first trainees start in September 2013. Primary mathematics specialist trainees with at least a grade B at A level receive an extra £2,000 bursary. Supporting specialist mathematics free schools for 16- to 18-year-olds, backed by strong university mathematics departments and academics. These free schools will aim to give our most talented young mathematicians the chance to flourish, and produce more mathematics, engineering and science graduates that are so important for the country’s longer term success. The application process for the scholarships will open in January 2013. Graduates interested in applying can register on the IMA’s website. Further details of the mathematics scholarship, including details of how to apply, can be found on the IMA’s website.. For more information on becoming a teacher visit the “Get into Teaching” website. The Institute of Mathematics and its Applications (IMA) is the UK’s professional society for mathematics and its applications. The IMA exists to support the advancement of mathematical knowledge and its applications and to promote and enhance mathematical culture in the United Kingdom and elsewhere for the public good. More information can be found on their website. 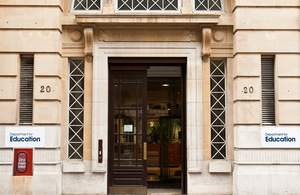 The London Mathematical Society is a major UK society for mathematics with a nationwide and international membership. The Society’s main activities include publishing journals and books, providing grants to support mathematics and organising scientific meetings and lectures. The Society is also involved in policy and strategic work to support mathematics and the mathematics research community. The London Mathematical Society’s website has more information. The Royal Statistical Society (RSS) is one of the world’s most distinguished and renowned statistical societies. It is both a learned society for statistics and a professional body for statisticians. Founded in 1834, the Society has more than 7,000 members around the world. The RSS is active in a wide range of areas both directly and indirectly relevant to the study and application of statistics. More information can be found on the RSS website. The Teaching Agency 2012 census and accompanying analysis report can be found on the Department for Education’s website. Further details on the results for the tests in Trends in International Mathematics and Science Study (TIMSS) and Progress in International Reading Literacy Study (PIRLS) can be found in the annoucements section.